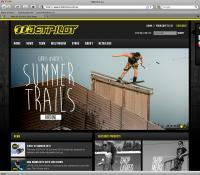 Jet Pilot is one of the leading brands globally in the Wakeboard and Freestyle Motocross industry. They needed a website to promote themselves, their products and their riders online. Jet Pilot proudly supports a number of the world's top boardriders including Chris O’Shea, Shaun Murray, Shane Bonifay, Emily Copeland, Eric Ruck, Brett Eisenhauer, Brenton Priestley, Richie Vaculik and Dru Adler. Combining a simple design with an extensive Content Management System, Jet Pilot’s new website now gives them the tools to build their brand awareness online. The new site features Video, Wallpapers, Blogs, Rider Profiles, Dealer Locator and an Online Catalogue. All managed by a customised TMD Content Management System via one central login. Access is granted where needed, for example, to allow team riders to login and update their own blog. TMD also works regularly with Jet Pilot to help market the brand online. This includes Email Marketing and advice on Social Media. We also provided customised feeds of website content for use within their iPhone App.